I'm having a great time visiting Kansas. The folks here are very friendly, and most are disgusted with their school board's recent actions. One told me "if we wanted our kids to be imbeciles, Alabama isn't that far away." 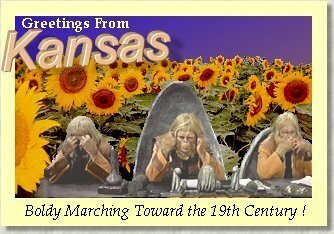 Although you might not know it from reading the papers, Kansas has about the same number of inbred cross-eyed mouth-breathers as we do back home - it's just that here most of them have jobs on the school board. I'm sending along a newspaper clipping you might find amusing. Linda Holloway, who chairs the Kansas Board of Education, announced that the renowned Dr. Zaius has been appointed to the board. "He is uniquely qualified," said Ms. Holloway, "having simultaneously served as both the Minister of Science and Minister of Faith in Ape City." She then picked up her banjo and played a stirring rendition of Foggy Mountain Breakdown. Dr. Zaius, who has been put in charge of lowering the states science education standards, has already announced several changes. "It is wrong to teach theories. We're not only getting rid of the theory of evolution, but also the theory of relativity and music theory. We'll also be purging aerodynamics from the text books, because flight is a physical impossibility, which I stated emphatically in the second movie." Most of the state's science teachers plan to keep teaching evolution, the most basic building block of biology. Some have been very vocal in their opposition to Dr. Zaius. When the Doctor tried to shake hands with high school biology teacher Steve Mesozoic, Steve pulled away and yelled "get your hands of me, you damned dirty ape!" The BOE is also considering The Scarecrow for a position on the board. Under advisement of Dr. Zaius they are waiting until he returns from Oz before making him an offer. "I can't put my finger on it," said Dr. Zaius, "but I have a feeling that after he visits The Wizard he may not be as qualified." Well, got to get back to being a tourist. Kansas City, here I come. I hear they got some crazy little women there. And I just visited a gift shop and picked up a Darwin Fish and a bumper sticker that says "If Evolution is Outlawed, Only Outlaws will Evolve." I just wish that were true. The Scopes Monkey Trial was a turning point in American history. Here's a Mencken's Eye View of it.